Draco the Dragon may very well be the magic dragon of the heavens whose fiery breath awakens the spirit within us. Draco called me into his lair and I have learned that his mysteries run deep. My interest in Draco started when a good friend crossed over into the spirit realm. This friend's messages from beyond said that Draco was the key. I was reminded to look toward Draco. In 2002 I realized that Draco the Dragon comes alive with fiery breath from early to mid-October during Libra! Yes, shooting stars known as the Draconids appear to radiate from Draco's head. Wow! Granted this is only a minor meteor shower, but slow, faint, yellow, fiery meteors really do radiate from his head! Peak fire breathing episodes occur October 6-10 from 9:00pm-dawn. Begin looking toward the Big Dipper in the northwest after sunset. "It was a rare and impressive event." Earth narrowly dodges a 10x stronger Draconid event. Will you see his fiery breath? 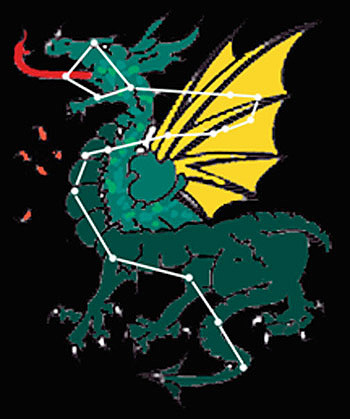 Draco the Dragon is a circumpolar constellation. It revolves around the celestial north pole and can be seen all year round in the northern hemisphere and virtually not at all from the southern hemisphere. Early October this Dragon lies in the northwest sandwiched between the Big Dipper and Lyra's brightest star Vega and the constellation Hercules. 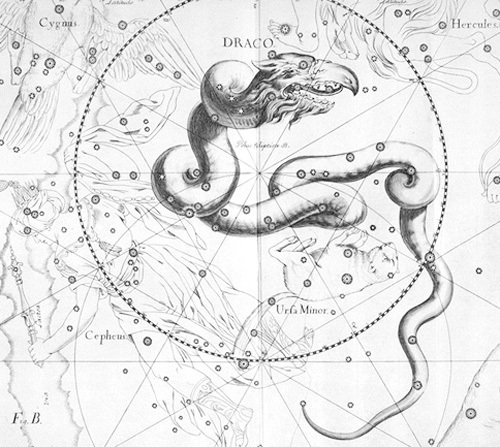 October Star Chart Draco is a dim constellation with no bright stars. As discussed above early to mid-October this dragon comes alive breathing fire out into our solar system. Djwhal Khul, the Tibetan, through the channel of Alice Bailey, links Draco together with Ursa Major and Ursa Minor, the Pole Star (symbol), the Pleiades, and the constellation of Capricorn as part of an esoteric astrology that has a transformational effect upon our solar system and upon its particular planets. She also states that at this time the mystery of their influence remains an unrevealed secret. Libra is also esoterically connected to Draco the Dragon. These two star groupings emanate wise compassionate energies that evolve our solar system and humanity. Draco oversees the advanced human being on the Path of Earth Service (symbol). Draco is the true ecliptic center (not the Sun) around which the Zodiacal Deities / constellations, our Earth and the planets revolve. The Kabala refers to Draco as the "...Tree of Life ... the Precious Stone, [Hmmm ... the Jewel in the Lotus] whose facets are projected onto the celestial sphere and which is part of the continuous flow of the Sea of Wisdom ... as proof of the existence of the Tree of Life, the twelve, the seven, and the three, He set them in the Teli [Draco], the cycle and the Heart." As the true ecliptic center / hub, Draco rules over physical manifestation or the realm of time, the cycles of birth, death, rebirth ... our conscious evolutionary journey around the wheel of Life, the zodiac. Draco, the fire breathing dragon, is the evolution of the coiled sleeping serpent and represents the Kundalini energy, the Fire of Life. Draco represents the unanimity amidst the diversity and holds the key to the doorway of the eternal timeless realm. Synthesize the diversity of Draco's realm ... twelve Zodiacal Dieties, Seven Rays and the Trinity of Light, Love and Will/Power ... and you master time and hold the key to eternal life. Wanna play with The Dragon? Perhaps Draco will reveal more of his mysteries at this time. Let me know what Life the Dragon breathes into you! with Planetary Treats and Celestial Delights!